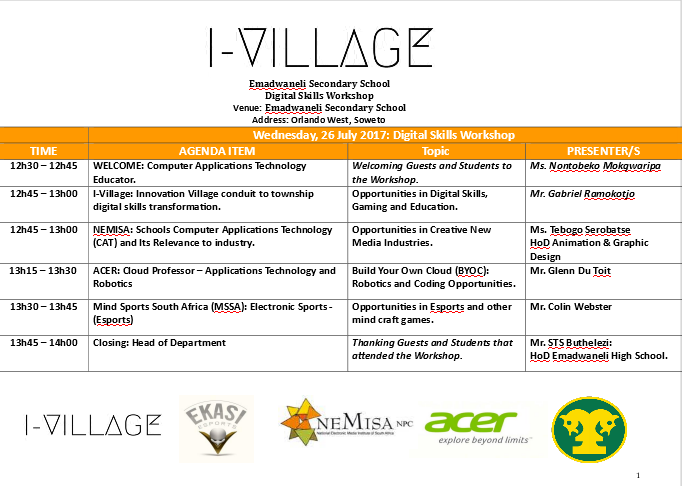 I-Village will be hosting a digital skills workshop, at Emadwaneli Secondary School, on the 26th of July 2017. The objective of the workshop is raise awareness on the digital career opportunities , understanding that more jobs today requires a level of adequate understanding of digital skills and further to ensure that our youth participate in the digital economy. The workshop will be conducted in collaboration with Emadwaneli Secondary School, The National Electronic Media Institute of South Africa (Nemisa), Mind Sport South Africa (MSSA) and Acer South Africa.. At I-Village we are committed to bring about digital opportunities to the youth, most importantly in the townships and rural areas and with the key objective that our youth not only become consumers, but active participants to the 4th Industrial Revolution, says. Mr Mpho Tladi - Business Development Manager at I-Village. The workshop will be showcasing digital career opportunities in Creative New Media Industries, Build Your Own Cloud (BYOC): Robotics, Coding and Electronic Sports (Esports). About Us: Innovation Village herein known as “I-Village” is a non-profit organisation that provides digital skills training to the students, entrepreneurs and unemployed youth in townships and rural areas. The IVillage is based in Soweto, Dube, Kronen Centre.